On the opening drive the New Orleans defense came up with a huge sack and fumble, leading to a touchdown drive and a quick 7-0 lead for the Saints. Mark Ingram scored on a 2-yard run. The Vikings offense responded with a touchdown drive of their own, capped off by a Jerick McKinnon 10-yard touchdown run. Tied 7-7 at the end of the 1st. Early in the second quarter, the Saints had a chance to take a 10-7 lead but Wil Lutz missed a 55-yard field goal attempt. Minnesota took advantage going 55 yards on 7 plays. Case Keenum threw a 3-yard touchdown to Latavius Murray to take a 14-7 lead. Not to be outdone, the Saints used 10 plays to go 75 yards to tie the game at 14. Alvin Kamara scored from a yard out. Right out of the gate to start the second half, the Minnesota defense picked off Drew Brees and started a drive at the 17 yard line. Unable to find any rhythm on offense, the Vikings settled for a Kai Forbath 28 yard field goal to take a 17-14 lead. After a handful of punts, the Saints were able to add a Wil Lutz 24 field goal to tie the game at 17. Tied 17-17 at the end of the 3rd. The Vikings run game wore down the Saints defense and it showed in the fourth quarter. 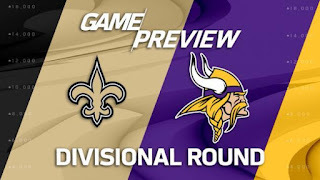 Minnesota started with a 33 yard field goal to take a 20-17 lead, then after picking off Drew Brees for a second time in the game, Case Keenum connected with Kyle Rudolph for a 9 yard touchdown. This game the Vikings a 10 point lead with just over 7 minutes left in the game. New Orleans cut the lead to 3, after another Alvin Kamara 1-yard touchdown run, however that's as close as they would get as the Vikings would run out the clock. Final Score: Vikings Beat the Saints 27-24.